If I told my friends in Los Angeles to come and eat in Beverly Hills, right on North Bedford Drive, shaking their heads would be probably the friendliest reaction I could expect. This is not a cool area, of ​​course, and most of the restaurants there are noisy, slick and simply characterless, or to say it another way, even more brutally: you really don’t want to spend your evening with the people here. Sometimes, though, it may be good to be a stranger in a city that you know quite well, but with far fewer prejudices than locals might exhibit. There are some people who would rather drive to Downtown LA, even though they live in Westwood, before deigning to eat out in Beverly Hills. What is the right description: brazenness, presumptuousness and / or hubris? Or is it: exclusiveness, exceptional quality and / or “superbe”? Certainly it is “genial” – brilliant – a place you hate or you love. I cannot believe that there is lot space between. As recently described Doung Dong (https://avdwineandfood.net/2016/01/14/song-nu-restaurant-duong-dong/) is the largest town at Southern Vietnamese Island Phu Qouc. Duong Dong – the little capital of the Southern Vietnamese Island called Phú Quoc is rich of live. Fishing, harbor and tourisms shall be the largest economic factors of the town. Consequently you can find either rather touristic places or more or less radical Vietnamese ones. Some few restaurants are attractive for both: local inhabitants and tourists which are ready looking for some other placese than directly at the beach. Once a while ago introduced by my friend David L. Molner I discovered one of my absolute favored restaurants in the world: 15 East! The name is the address: 15 East, Manhatten. Although you can find reviews about Sushi restaurants time by time at this blog, (https://avdwineandfood.net/2015/06/12/nobo-budapest/) Japanese cuisine – sushi, sashimi etc. – is usually not my most preferred food. It is always a very welcomed alternative as it is fresh, in certain regards light and probably healthier than much other stuff. The most problematic aspect about this food is that it needs to be fresh and it – let’s be honest – needs people who are ready to pay decent amounts of money for it. Both aspects are probably the reason why we can’t find too many really excellent Japanese Restaurants in Europe (in particular Germany) comparing to USA. Beautiful location, great architectonic and stylish building above the beach of Hossegor (30-40 km in the North of Biarritz) – so your expectation are reasonable high as the internet is full of some ecommendations, too. Many of you have heard of the fashionable chain of modern Japanese restaurant and Sushi place called Nobu. The most of Nobus are in top metropolises as Los Angeles, New York, London, Moscow and Tokyo and many more but some selected ones are in rather different places as Istanbul or Johannesburg. Really surprisingly there is a Nobu in Budapest which is a beautiful city but certainly not a cosmopolitan town. Located at the Kempinski Hotel and owned by no one else than film mogul Andy Vajna this restaurant is exceptional and a pearl among Budapest’s gastronomical offers. Shall I disclose that my profession brings me to Cannes occasionally every year even three times? Everyone who knows me because of my job is aware of current Cannes Film Festival as many of those are right now in Southern France. There are many reasons to hate Cannes: for example the most arrogant and also expensive taxi drivers in the world – almost never available, unfriendly but certainly the opposite of modest, this is one of the only places in the world where you would consider a brand new Passat as lousy car. Many waiters are slow and rude; only those ones who are from other countries – in particular Eastern Europe – are often really nice. I always say that becoming a waiter in Cannes doesn’t require much French as the owner teaches them to behave as follows: “as soon as a guest enters the café don’t hurry, remain staying at the bar as each afternoon. After ca. five minutes – and only if the guest tries to lead some attention to itself – tell him: “J’arrive”. In the case this (maudit) guest is still counting on you after twenty minutes of waiting, just pass him and say “deux minutes”. And then, just some more minutes later, deliver the bill”. Being in Cannes since years you wouldn’t be shocked if someone in real would bill you for nothing. Since a single cappuccino at the Croisette is considerable affordable if it costs “only” € 8 (!) we all shouldn’t be astonished to pay just for foam. 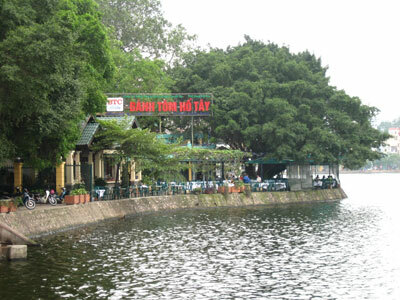 This is not only a very popular place for all people of Hanoi. It has a historical meaning as this inn is over 50 years old and has been always in private ownership which is quite remarkable considering ruthless disappropriation in the second half of seventies. If you ever have been in Hanoi it is very hard to imagine how quiet and even slow it was in this town just 20 years ago. Although socialism may have some positive sides – in particular in regard to social wealth in Vietnam – it also has had terrible consequences to a country of small but proud farmers and people of traders, dealers and retailers. The most famous meal of Bánh tôm Hồ Tây is the Hồ Tây shrimp cake. During Vietnam War, when young men got called to move to the south to war, families went to this place for a last big dinner. Always when Hanoi people had to celebrate something this restaurant has been first place of celebration.